For Listgirl's birthday I (the husband, Todd) am crashing the party to tell you one of my favorite things about her. For many years now, Christine has been practicing documenting and preserving memories. She is now a master. Like Yoda. But still alive. There are many ways this documentation happens, photo taking, writing in journals, project life, and bookmaking. But I love the blog the best. Why? Because I am human (don't let her tell you otherwise!) And I can tell you the best way to reach and connect with humans. With stories. The blog has pretty pictures but it also has the stories to go with them which is why I think it is the most important way she preserves our memories. Let me share a couple of favorites with you. In 2009, we hired contractors to do a kitchen remodel. As in demo the whole thing, rip up the walls and start over kind of remodel. That meant for 3+ months we had people in our house, dust, noise, and no place to cook our food. But like all things, that period came to an end and the result was a beautiful, modern kitchen that I enjoy cooking in immensely. So on July 11th, we decided to invite a few friends over and celebrate the new goodness. If you asked me what I remember about that day, I'd say the food turned out good, I was running late (as usual) and our wonderful guests included AJ, Meera, and Yaiza. Let's take a trip back in the time machine to see how I did, shall we? Oh, we ran in the morning with our running club. Totally forgot about that. No wonder I didn't get an early start. Oh, Sally and Brian were there too. And I was mistaken, Meera didn't make it because of a sick child. Reading Christine's account I can see what I cooked. Hmmm, I forgot about that roasted veggies potato and squash dish. 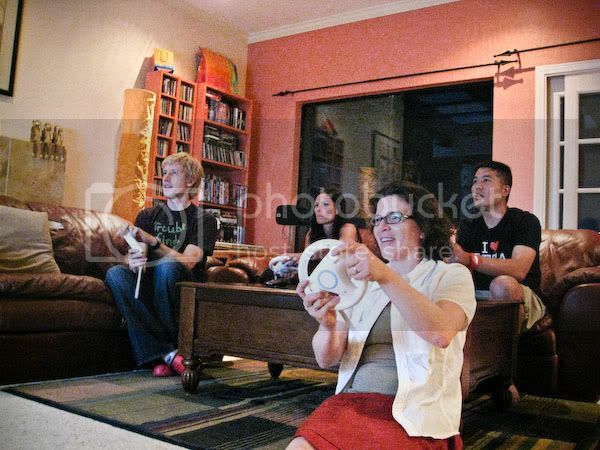 And I forgot we had a super competitive Mario Kart Wii session. Reading this in turn cues other memories. I had run out of coconut milk so I had to send AJ out to buy a can. Coconut milk is hard to substitute for. Brian couldn't stop eating the salmon even though he insisted he felt guilty eating it. That scene was pretty comic. (He has an on-and-off vegetarian diet.) And I learned that night that Yaiza and Brian really love to compete. That was fun, let's do another! A month earlier, Peppermint and Tom came to visit. Several things were on the agenda for their first visit to San Diego, one of which was attending Comic Con. It was our first time too but I don't remember much of that day. It was a blur of sights, sounds, smells and costumes. But reading the post, I am reminded just how big and colorful all the displays were. I had totally forgotten about that Curious George shirt that I bought for her on a birthday. Luckily, this post does nothing to jog my memory of all the crowd-related smells. (!) 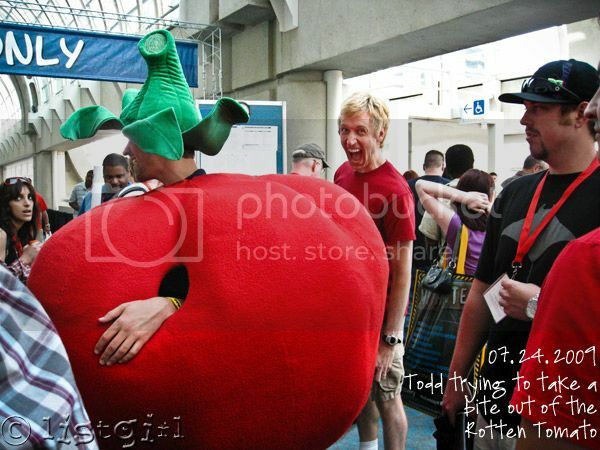 Most importantly, there's the photo of me trying to bite the giant tomato. I didn't forget about this per se, but I forgot it happened at Comic Con. Without this event and photographic documentation thereof, the Todd Shot Phenomenon might never have been born. That act of human-on-fruit violence really cemented the Todd Shot in our collective lore. Are you seeing why I value this blog so much. I remember what I've done and where I've been to an extent. The posts I've highlighted are 3 1/2 years old. I wonder how I'd do with events 6 years ago? Or 10? We do a lot of fun things in our lives and now the memories don't have to fade like they otherwise would. I'm told that some of you really enjoy reading listgirl.com. And I am glad. But even if nobody else read it, it would be an invaluable journal for the two of us. One memory that is really fresh right now is our birthday(s) dinner with friends about a week ago. I still remember most everything about it. It was a really special night and everyone who attended sent me, Christine or both a note to say what a great night it was with great friends. And years from now, I can read the post and the great memories will flood back and fill us with warmth all over again. And that's why I love the Listgirl blog. Todd, I like listgirl, too. I really enjoy seeing the photos and especially reading about what you two do. You two live an exciting and loving life together. TFS. Happy, happy birthday! Great post, Todd! I love this!! Hope you have a wonderful birthday! Well said Todd!! Happy Birthday Christine! Happy Birthday to both of you and I totally agree Todd, these blogs are our memories! It's so fun to go back and look and see what was going on in our lives! Love your wife's blog. Eeeek ... that should read AWESOME post not awesine post. D'oh! Awwwwwwwwww!!! So sweet!! He's a keeper! He loves you soo much!! AWWWW...This is so sweet!!! I love this. How sweet of Todd. 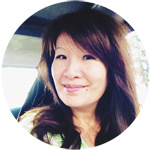 I love reading your blog too Christine!! I feel like I know a little bit more about you and Todd and your life through the small glimpses you allow us to see into your world. I appreciate that you take the time to document your life and I love getting to "know" you better!!! So cute! So sweet! So inspiring! So so true. It has been very frustrating going back to scrap older pictures and i can't remember anything. Great encouragement. We love listgirl.com too!